Long before the rise of Bhangra music, soulful melodies and the legendary voice of Kishore Kumar enchanted millions globally. Born Abhas Kumar Ganguly, Kishore Kumar is most remembered for his contributions as a lyricist, composer, producer, director, screenwriter and scriptwriter. He won 8 Filmfare Award for Best Male Playback Singer and holds the record for most number of Filmfare Awards won for that category. Playback singers record songs for soundtracks, and actors or actresses lip-sync the songs for cameras, while the actual singer does not appear on screen. Kishore Kumar was born into the Bengali Brahmin Ganguly family in Khandwa, Central Provinces and Berar (now in Madhya Pradesh) as Abhas Kumar Ganguly. His father Kunjalal Ganguly (Gangopadhya) was a lawyer. His mother Gouri Devi came from a wealthy Bengali family. Kishore was the youngest of four siblings, the other three being Ashok Kumar (the eldest), Sati Devi, and Anoop Kumar. While Kishore was still a child, Ashok Kumar became a Bollywood actor. (Later, Anoop Kumar also ventured into cinema with the help of Ashok Kumar). Spending time with his brothers, Kishore also started to take a keen interest in movies and music. He became a fan of singer-actor Kundan Lal Saigal, whom he considered his guru, and tried to follow Saigal’s singing style. After Ashok Kumar became a Bollywood star, the Ganguly family used to visit Bombay regularly. Abhas Kumar changed his name to Kishore Kumar and started his cinema career as a chorus singer at Bombay Talkies, where his brother worked. His first film as an actor was Shikari (1946), in which Ashok Kumar played the lead role. Music director Khemchand Prakash gave him a chance to sing Marne ki duayen kyon mangu for the film Ziddi (1948). After this, Kishore Kumar got many other assignments, but he was not very serious about a film career. In 1949, he decided to settle in Mumbai. Kishore Kumar played hero in the Bombay Talkies film Andolan (1951), directed by Phani Majumdar. Although Kishore Kumar got some assignments as an actor with help of his brother, he was more interested in becoming a singer. He was not interested in acting, but his elder brother Ashok Kumar wanted him to be an actor like himself. He starred in Bimal Roy‘s Naukri (1954) and Hrishikesh Mukherjee‘s directorial debut Musafir (1957). Salil Chowdhury, the music director for Naukri was initially dismissive of him as a singer, when he came to know that Kishore Kumar didn’t have any formal training in music. However, after hearing his voice, he gave him the song Chhota sa ghar hoga, which was supposed to be sung by Hemant Kumar. 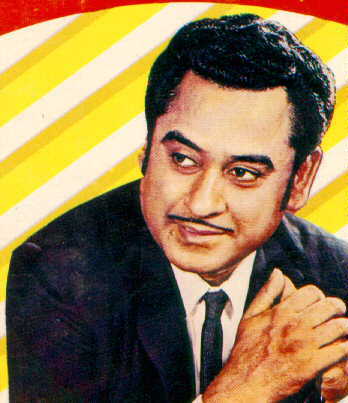 Kishore Kumar starred in films New Delhi (1957), Aasha (1957), Chalti Ka Naam Gaadi (1958), Half Ticket (1962), and Padosan (1968). Chalti Ka Naam Gaadi, his home production, starred the three Ganguly brothers, and Madhubala. The film is about romance between a city girl (Madhubala) and a car mechanic (Kishore Kumar), with a subplot involving the brothers. Music director S. D. Burman is credited with spotting Kishore Kumar’s talent as a singer, and advancing his singing career. During the making of Mashaal (1950), Burman visited Ashok Kumar’s house, where he heard Kishore imitating K. L. Saigal. He complimented Kishore, but also told him that he should develop a style of his own, instead of copying Saigal. Kishore Kumar did not have a formal training in music. He kept Burman’s advice in mind, and eventually developed his own style of singing, which featured the yodeling that he had heard on some records of Jimmie Rodgers bought by his brother Anoop Kumar. S. D. Burman recorded with Kishore for Dev Anand‘s Munimji (1954), Taxi Driver (1954), House No. 44 (1955), Funtoosh (1956), Nau Do Gyarah (1957), Paying Guest (1957), Guide (1965), Jewel Thief (1967), Prem Pujari (1970), and Tere Mere Sapne (1971). He also composed music for Kishore Kumar’s home production Chalti Ka Naam Gaadi (1958). Some of their initial films included the songs Maana Janaab Ne Pukara Nahin from Paying Guest, Hum Hain Rahi Pyar Ke from Nau Do Gyarah (1957), Ai Meri Topi Palat Ke Aa from Funtoosh, and Ek Ladki Bheegi Bhaagi Si and Haal Kaisa Hai Janaab Ka from Chalti Ka Naam Gaadi (1958). Asha Bhosle and Kishore Kumar performed duets composed by S. D. Burman including Chhod Do Aanchal from Paying Guest (1957), Ankhon Mein Kya Ji from Nau Do Gyarah (1957), Haal Kaisa Hai Janaab Ka and Paanch Rupaiya Baara Aana from Chalti Ka Naam Gaadi (1958), Chhedo Na Meri Zulfein from Ganga Ki Lahren (1964), and Arre Yaar Meri Tum Bhi Ho Gajab from [Teen Devian|Teen Deviyan] (1965). C. Ramchandra was another music director who recognized Kishore Kumar’s talent as a singer. and their collaborations include Eena Meena Deeka from Aasha (1957). Kishore Kumar’s work includes, Nakhrewaali from New Delhi (1956) by Shankar Jaikishan, and C.A.T. Cat Maane Billi and Hum To Mohabbat Karega from Dilli Ka Thug (1958) by Ravi. Kishore Kumar produced, directed, and acted in the film Jhumroo (1961). He wrote the lyrics for the title song, Main Hoon Jhumroo, and composed music for all the songs in the film. Later, he produced and directed the film Door Gagan Ki Chhaon Mein (1964). He also wrote the script and composed music for the film. The film is based on the relationship between a father (Kishore Kumar), and his deaf and mute son (played by his real-life son, Amit Kumar). He made another two films called Door Ka Rahi (1971) and Door Waadiyon Mein Kahin (1980). In the 1960s, as an actor, Kishore Kumar built up a notoriety for coming late for the shootings, or bunking them altogether. His films flopped frequently, and he also landed in income tax trouble. As a singer, his work in this period includes Zaroorat Hai Zaroorat Hai from Manmauji (1961), Gaata Rahe Mera Dil from Guide (1965), and Yeh Dil Na Hota Bechara from Jewel Thief (1967). In the late 1960s, Rahul Dev Burman worked together on the soundtrack of the film Padosan (1968), in which Kishore Kumar sang the songs Mere Saamne Wali Khidki Mein and Kehna Hai. Padosan was a comedy film starring Kishore Kumar as a dramatist-musician, Mehmood as a Carnatic music and dance teacher, and Sunil Dutt as a simpleton named Bhola. Kishore Kumar’s character in the film was inspired by the personality of Kishore’s own uncle, Dhananjay Bannerjee (a classical singer). The highlight of the film was a musical, comical duel between Kishore Kumar-Sunil Dutt and Mehmood, Ek Chatur Nar Karke Singaar.